Free Shipping Included! 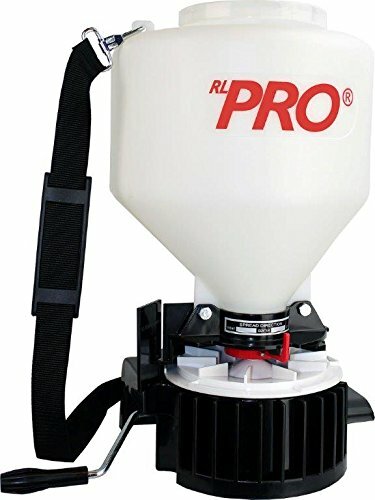 RL Flo-Master 420PR Portable Spreader, 20-Pound by RL FLOMASTER at The Net Stores Network. MPN: 420PR. Hurry! Limited time offer. Offer valid only while supplies last. Portable spreader that is worn on the chest. It has a durable stand and large filler opening for easy ''tip free'' filling. The cap prevents spills. Portable spreader that is worn on the chest. It has a durable stand and large filler opening for easy "tip free" filling. The cap prevents spills. The rugged sealed gearbox, with metal helical gears make cranking easy and efficient. There is directional control for spreading left, right or center as well as flow rate, There is a padded shoulder strap. This spreader has a multitude of uses such as: On hillsides, for use around buildings with mature shrubs, applying insecticides and ice-melt products to name a few. A built-in agitator provides a steady flow of material to the impeller. Root-Lowell's commitment to quality goes far beyond the excellent sprayer you buy. We have invested a great deal of time and resources into building a top-notch Consumer Service Department. Through our Consumer Service Hotline, our Flo-Master representatives can respond to any questions you may have regarding maintenance, operation and repairs of your RL sprayer. And this is where you can buy replacement parts for your sprayer. This service is available year-round - Monday through Friday, 8:00 a.m. to 7:00 p.m., Eastern Time. From March 1 through August 31, it's also available on weekends - Saturday and Sunday, 10:00 a.m. to 4:00 p.m. Through our Consumer Service Hotline, you have immediate access to our expert knowledge and support for as long as you own your RL Flo-Master sprayer.